We're so close to finishing this project! I'm an avid HGTV watcher so I know that renovation projects often cost more and take longer than the original estimates but I was not prepared for the extant to which that would happen in ours. Thanks to a combination of planning errors, unexpected issues, and scope creep (I'm looking at you, D! ), this five week project has turned into a three month one. We've come a long way from the builder-standard kitchen we started with and the empty shell we had when we left for Thailand. So far, the floors are done (I'll be doing a post on finished concrete floors soon) and all the cabinets are in. 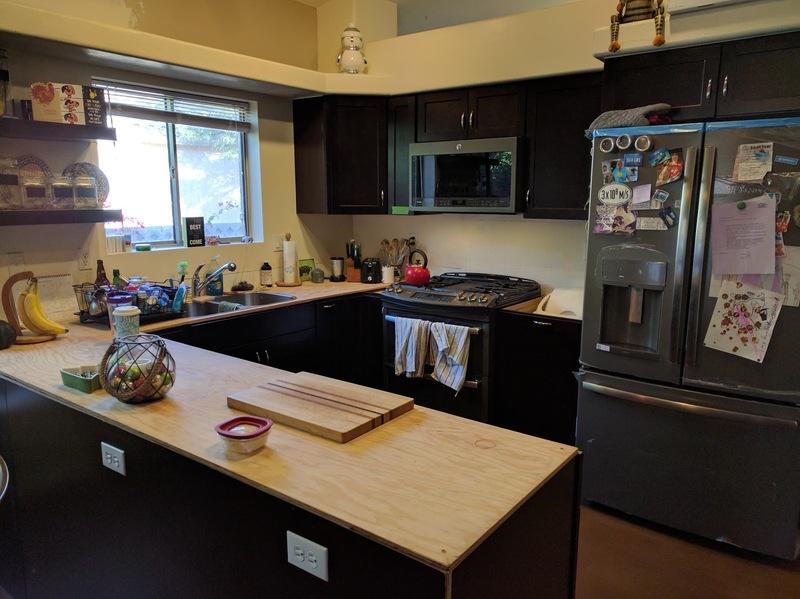 The counter top material was on back order because of the holidays but our contractors took pity on us and put down some plywood for me to use for now. They've also loaned us a sink a faucet so I'm actually able to use the kitchen. It's so nice to be back to cooking the way we like to. The dark cabinets look great with the floors and the slate-finish appliances. I can't wait to see it all put together once the counters go in next Tuesday! 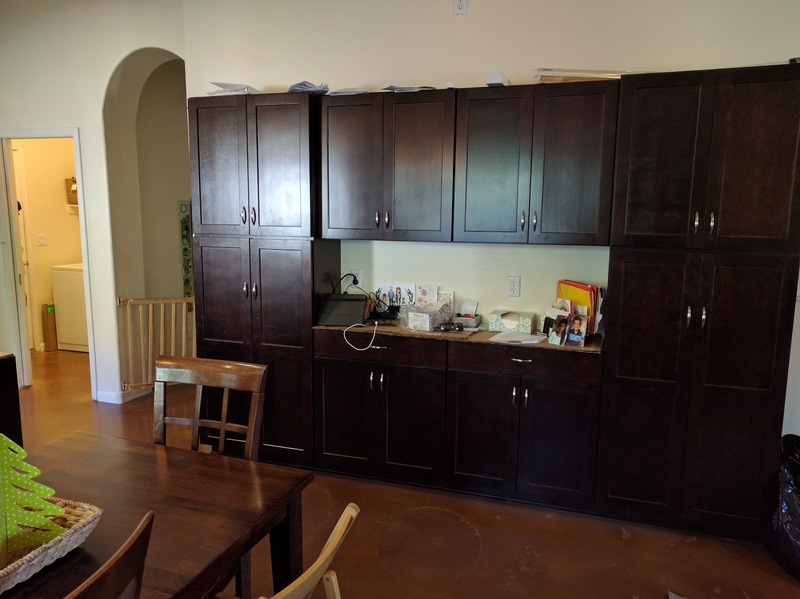 Our new pantry is the same size as our old one, at least in terms of the area that it covers, but this has so much more storage. I think the dark finish also makes it appear larger and a little bit imposing. 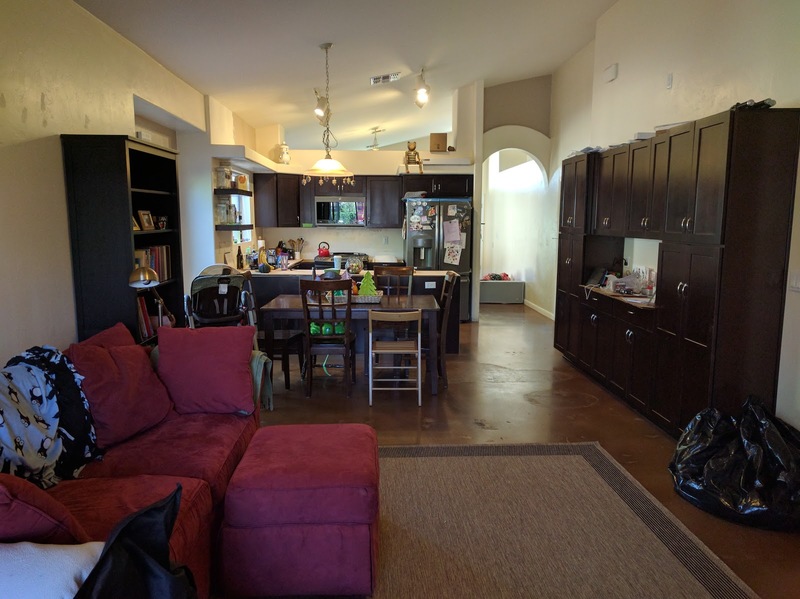 The storage area in the middle already looks a little cluttered but that's what was meant to happen there- the tall pantries hide the mess from view from the front room and a dedicated "stuff" space meas that my new peninsula stays neat and clean. The peninsula is narrower than our island was and it's only two feet longer but there's so much more usable work space that it feels bigger. 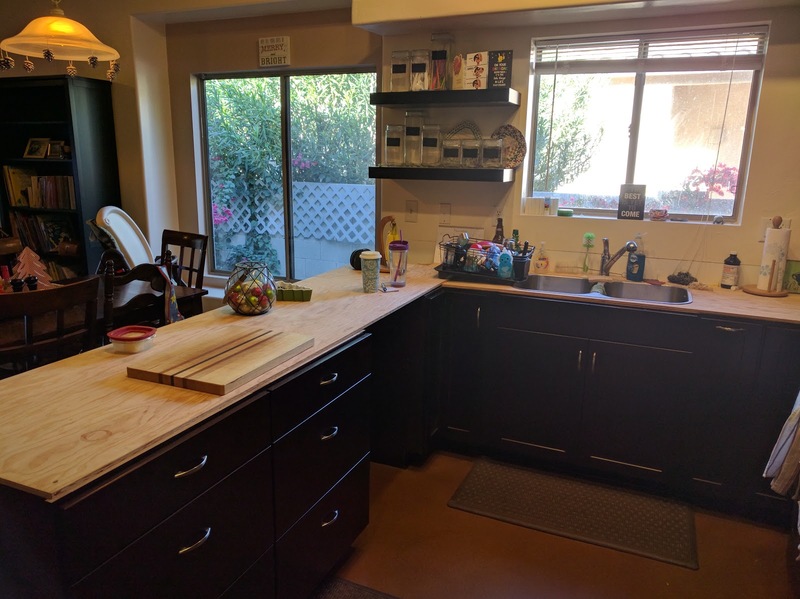 We also pushed it back into the dining space about six inches, which doesn't sound like much but it's really opened up the space, especially between the refrigerator and the peninsula. We decided to go with GE appliances in the slate finish. I know everyone is gaga about stainless steel these days but with four little kids in the house, I would have spent all my time cleaning fingerprints off of them. 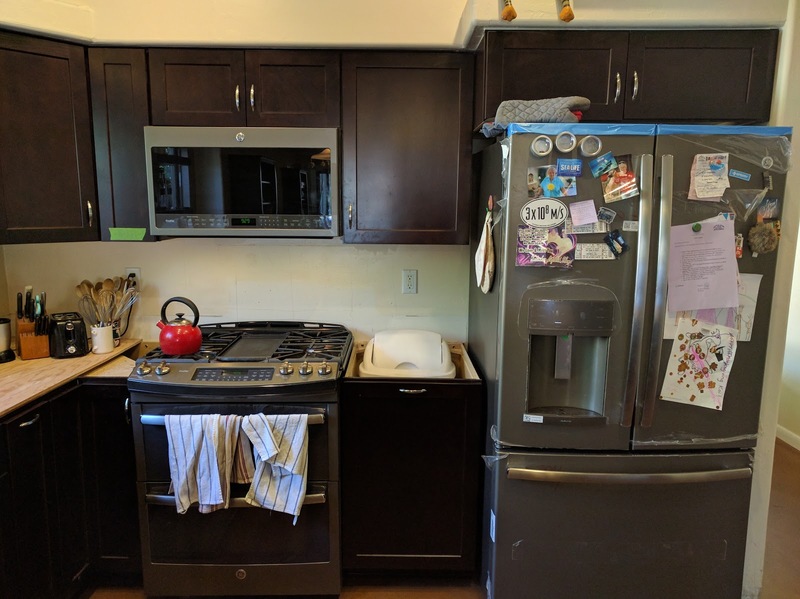 Since the slate finish is only offered in the top-of-the-line models, these cost more than we wanted to spend but they're really great appliances and I've been appreciating the extra features, in particular the programmable double oven. Merry Christmas too me! 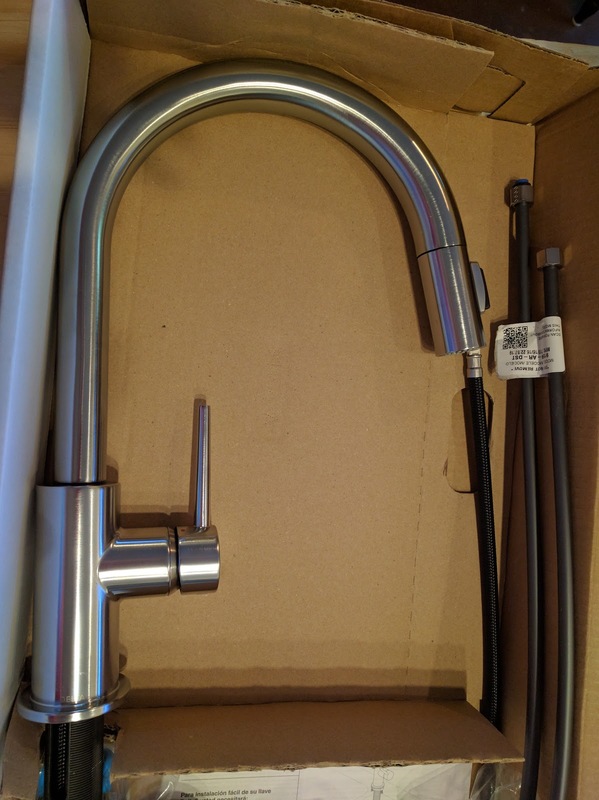 I know it doesn't look like much but this faucet is absolutely beautiful. I'm a sucker for clean, elegant lines and I really wanted to buy it but was going to settle for a less expensive version when D surprised with with it as an early Christmas present. As I said, we're almost done with this project. The counters will be installed on Tuesday and once that's done, the plumber can come and put in the dishwasher, sink, and faucet. After that, the last project is to tile the back splash. Currently, our contractor says everything should be done by the 15th. It will be so nice to have our house back in time for Christmas! Have you done a renovation project? Did you run into any stumbling blocks? Are you planning any future renovations?